The Culture is the station's first show to highlight the Black experience on UM's campus. It premiered on University of Miami Television this semester. Sophomores Rachel Smith and Kristion Matas were sitting at the University of Miami TV general body meeting in January when they felt something was missing. Smith and Matas didn’t feel any of the seven existing TV shows the station offered represented their viewpoints. “We realized that there wasn’t a show that talked about the things we wanted to talk about,” said Smith, a broadcast journalism and sports administration double major. So they decided to create one that did. Smith, alongside Matas, conceived the idea to create a new show called “The Culture,” UMTV’s first show to highlight the black experience at UM. The 15-minute show has different segments that cover culture, politics, entertainment and sports with a diverse cast. 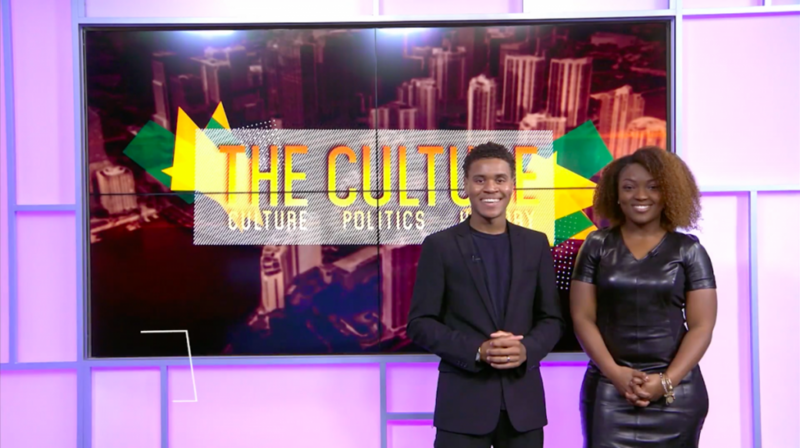 In the four-episode spring 2018 season, “The Culture” covered political and social issues, including the national gun control debate and the “Black State of UM,” where different leaders of organizations talked about what’s going on in black UM. The “heart of the show” is “The Roundtable,” where a panel of students discusses issues plaguing the community, including gun violence against blacks, demonstrated by the shooting in March of an unarmed Stephon Clark at the hands of police. Smith said the goal of the show is to provide a space for issues that face black people, analyzed and presented by black people – something that does not often happen. However, for the idea of the show to come to fruition took some work. Smith and Matas went from one School of Communication faculty member to another, pitching their idea until they were referred to one that got on board with the project. UM professor Winston Warrior said when he was approached with the idea to create a show that gives an underrepresented population on campus a voice, there was “no way” he could turn it down. “To have students want to start things and start to pursue it, and then pursue it in a serious way, in my opinion, should be deemed with respect and listened to, at least,” Warrior said. Warrior, who is African American, said he categorizes the idea as “trailblazing” and one that begs the attention of many. Warrior is a double alumnus from UM – he received his BBA in international finance and marketing and his MBA in marketing. Warrior, who is also the principal marketing and business strategy consultant of Vintage Consulting & Entertainment, said he wished he had thought of the idea when he was in school. Smith said though UM is one of the most diverse campuses in the United States, there aren’t “a lot of black people” on UM’s campus. “It’s an interesting experience,” Smith said. According to the 2017-2018 UM Fall Fact Book, 10 percent of UM’s population identifies as black. Tre’Vaughn Howard, a freshman majoring in broadcast journalism, said “The Culture” has given him the opportunity to offer “valuable input” to the production. He said the show also serves as a resource for other black students who are looking to be better represented in student media. “The show highlights not only the black experience at UM but also gives new perspectives from organizations and events that otherwise have not been showcased,” Howard said. “The Culture” will be back for the 2018-2019 academic year. To watch the show, visit umtv.miami.edu/shows/the-culture.